During the campaign season it suddenly became acceptable to bully and hate and demean people who were not white or Christian or straight. Racism, mysogyny, and anti-semitism all reared their ugly heads. Trolling and name calling were the appetizer on this new American menu, as harassment and violence became the entree. For dessert we have the prospect of families torn apart as immigrants are threatened with deportation and American Muslims are attacked for their beliefs. At the University of Pennsylvania, black students were added to a group text-messaging chat about “lynching” using the app GroupMe. The creators of the group scheduled a a “daily lynching” through the app’s calendar. At First Coast High School in Jacksonville, Fla., signs reading “whites only” and “colored” were posted above drinking fountains. In Koylton Township, Mich., a Mexican-American family woke to find a “wall” made of cardboard boxes blocking their driveway. 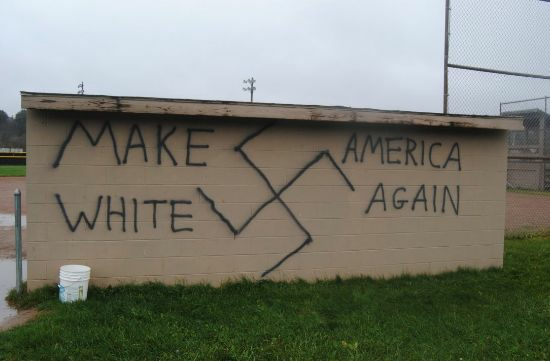 The boxes and driveway were defaced with graffiti with references to Donald Trump. In Murfreesboro, Tenn., a gay couple found a note with a homophobic slur on their doorstep. The note was pinned to a package by a knife with a picture of Donald Trump on its handle. Intimidation and harassment has increased at schools. A middle school in Bethesda, MD found swastikas in a boys bathroom for the second time in the past two weeks. Hispanic children were taunted with threats that they will be deported and immigrants warned they will be sent back to where they came from. It didn’t seem to matter to the person who vandalized the car of the woman wearing a scarf for sun protection was not a Muslim, or that the so-called migrant told to go back to Mexico wasn’t Hispanic. Equally disturbing, the Confederate flag, a symbol of racism and suppression, has been normalized. You see them just down the road from my home in Pennsylvania. Why aren’t these attacks being condemned? Where is the outrage? 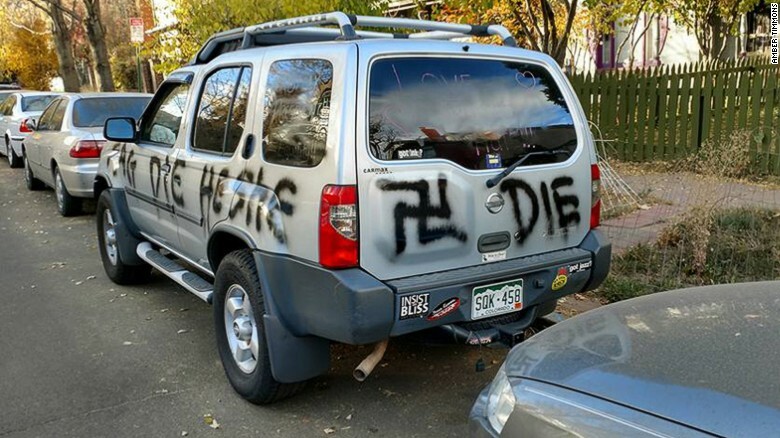 A transgender woman in Denver, CO had car vandalized. The front has the word “Trump” on it. Photo attributed to CNN.com. As we navigate these difficult times I have to remind myself that America has grown and thrived because of its diversity. Our strength has always come from the breadth and depth of talent in every shape and size. And yet, we now face some of the same old threats. The past repeats itself. As a woman I was prepared to cheer the breaking of the biggest glass ceiling. I wrote earlier about the continued challenges facing women. Where to go now? Will we be judged and rewarded for our number, rated on a scale from 1 to 10? Will we be relegated to second class citizenship, or worse? Does the lineup of old white men in the new administration signal a march backwards for the rest of us? How could it not. It’s a old adage that history repeats itself. Unfortunately, most of us don’t learn its lessons and continue to fall into the same old traps. My parents began their lives during the 1930s with its isolationist tendencies, which gave way to the aggressiveness of a country at war in the 1940s. Then came McCarthyism and fears of the “Red Menace.” Are we heading into yet another fearful time when looking or living differently will garner unwelcome attention? What does this mean about who we are as a people as we move forward into this uncertain future? “Watching white nationalists celebrate while innocent Americans cry tears of fear does not feel like America.” — Harry Reid. Symbols of major world religions. I will likely not be personally affected by this election. It will not have any significant impact on my income or work situation. Hip hip, you say, don’t worry, everything will be okay. But complacency and self interest are not words I want to embrace. Because I am okay is exactly why I must not be complacent. I challenge you to look around and find an organization that needs help and give them your support. The specter of the unraveling of hard fought rights is before us. I try to remember that we are in the year 2016, not 1966 or 1946 or 1916. But sometimes when I close my eyes I see another era. Let’s more forward, not backwards. We cannot let our national credo become Make America Scared Again. To everyone who is white and Christian and straight I say to you: walk a mile in someone else’s shoes. Look around you and see what the world looks like from their vantage point. Tell me how it feels to be called names because of the color of your skin or religious beliefs or sexual orientation. Many of our brothers and sisters now walk as strangers in this new world. I have gone through the gamut of emotions this past week: fear and anxiety, anger and disappointment. I keep telling myself, don’t worry. This is America. We don’t live in communist Russia, or Nazi Germany, or a Third World dictatorship. What can happen? Can we have our hard fought civil rights taken away? Can we have our votes suppressed? Can the government take us backwards to a time when white men reigned supreme and the rest of us had to get out of the way? Can the rich get richer and more powerful? Are we heading towards autocratic government? You betcha. It’s an easy thing to accomplish when the discussion is one-sided and nothing stands in your way. The election is over, a fait accompli. Nothing to be done about it. But that’s not really true. In any democratic society it is the responsibility of each citizen to play a role in maintaining that democracy. We have to keep legislators honest and remind them of their obligations to their constituents. We can work with a non-profit. Get involved in local politics. Make phone calls, write letters, and don’t take no for an answer. Talk to young people and educate your neighbors about our democratic system and how it is supposed to work for everyone. Give to charities you believe in. They need your help. Doing nothing is unacceptable. It’s the coward’s way out.